Now that the lawn is open, many of our signature programs are returning. We'll announce the lineup for our HBO Bryant Park Summer Film Festival soon, but for now be comforted that Bryant Park Yoga presented by Athleta is making its return in less than a week. 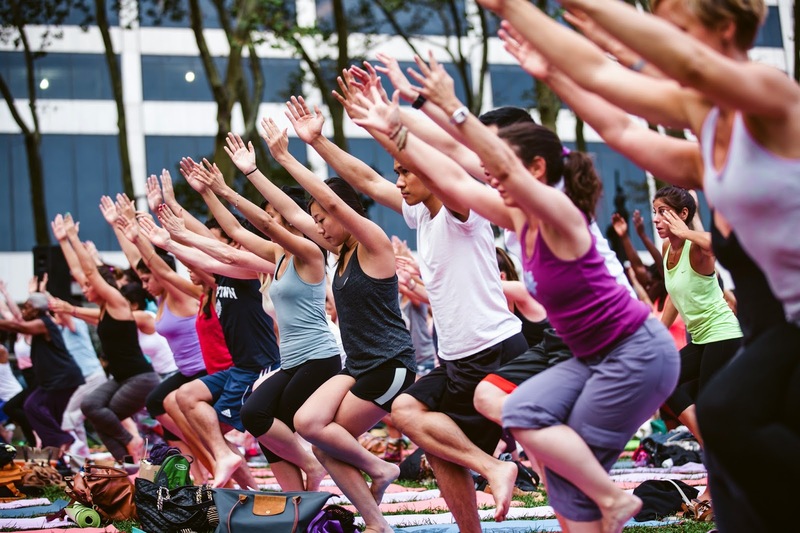 New York's favorite outdoor yoga series returns for its twelfth season on Tuesday, May 19 at 10am. The biggest change that yogis will notice is our partnership with Yoga Journal to curate the series. Through Yoga Journal's connections, we're offering classes with the hottest yoga teachers in the country. Yoga Journal readers and others in the know may recognize celebrity teachers Tiffany Cruikshank, Dan Nevins, Sianna Sherman, Stefanie Eris, Paige Held, and Dana Trixie Flynn, who are all teaching at our free classes this season. Hundreds of yogis do chair poses. Like previous years, the opportunity to be rewarded for all your downward dogs returns with the Frequent Yogi Card. Earn a stamp for each class you attend. For every twelve stamps you earn, you'll receive a $25 dollar gift card to Athleta, $50 off a YJ LIVE! Event of choice, and a voucher for a one-year subscription to Yoga Journal for just $10. At 24 stamps, you'll receive a second $25 Athleta gift card, and $100 off a YJ LIVE! Event of your choice. And at the end of the series, one lucky loyal yogi will be drawn to receive one full YJ LIVE! Event pass, valued at $970. Just like last year, Flavorpill returns as our media partner. Reserve your spot for class online at http://yoga.bryantpark.org. We're offering the 10am Tuesday and 6pm Thursday classes, and this year have increased the number of scheduled classes from 36 classes to 38.